Beautiful Peridot, the birthstone of August and also the 16th wedding anniversary gift. The peridot is usually a bright lime green to an olive green color. Many believe Peridot brings peace, success, and luck to the wearer. It is believed to attract love and calm anger. Peridot has been worn since ancient times, some of Cleopatra's emeralds as said to have actually been Peridot. 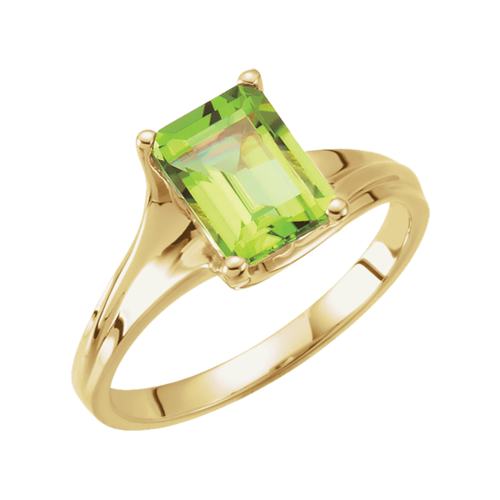 With all of these great properties and belief's, the Peridot ring is a great choice. 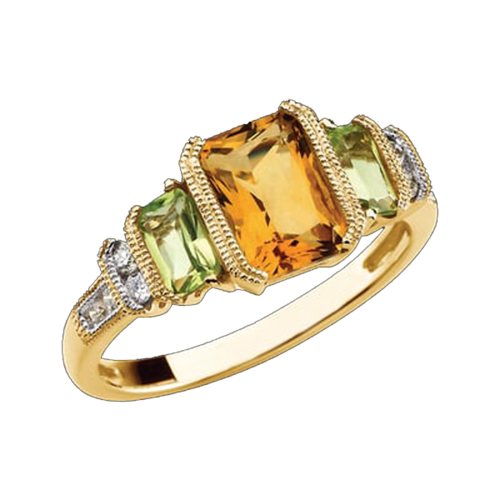 Vibrant Peridot gem and 14k yellow gold ring. This brilliant ring features an 8x6mm emerald cut AA quality faceted peridot gemstone. 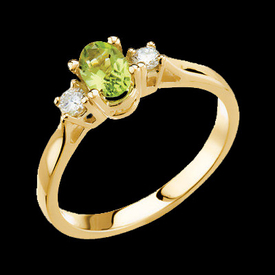 The peridot sits softly in 14k gold prongs, a very pretty design ring. This ring weighs around 4 grams. We are able to create this ring in 14k white gold, 18k gold's, or Platinum. Vibrant 14k white gold Peridot and diamond ring. This wonderful butterfly design white gold ring features a 9x7mm oval genuine Peridot center with a butterfly on either side of the center. Diamond accents give a little twinkle to the butterfly's and total .06ct tw. Delightful 14k yellow gold peridot and diamond ring. A genuine oval peridot measures 6x4mm and weighs .55 carats. Round diamonds total 1/6ct tw. A very nice ring. Striking pear shaped Peridot 14k white gold ring. Large genuine peridot in a pear shape measures 10x7mm and is AA quality. 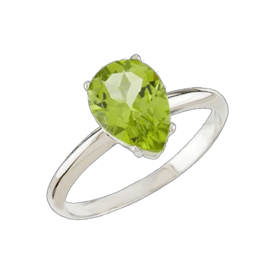 14k white gold ring is a very simple narrow band but explodes with the vibrant green peridot. Beautiful ring with a basket style setting for the gemstone. Festive combination, 14k Yellow gold Peridot, Citrine and Diamond ring. Center Citrine is radiant octagon cut and measures 8x6, 1.45ct. Peridot are each 5x3mm radiant octagon cut. Accent diamonds total aprox. .09ctw.